The Mycenaean civilization takes its name from the Palace of Mycenae which was discovered by renown German archaeologist Heinrich Schliemann. The Mycenae people arrived in Greece around 2000 BC. They did not become a dominant culture until they conquered the Minoans sometime around 1450 BC. At this time they were an agriculture based economy that had become very prosperous from trade. The Mycenaean civilization was very warlike, and they were under constant attack from barbarian tribes. Largely, this was because instead of locating on one of the many highly defensible Greek islands they chose to live on the mainland where they were highly vulnerable to attack. 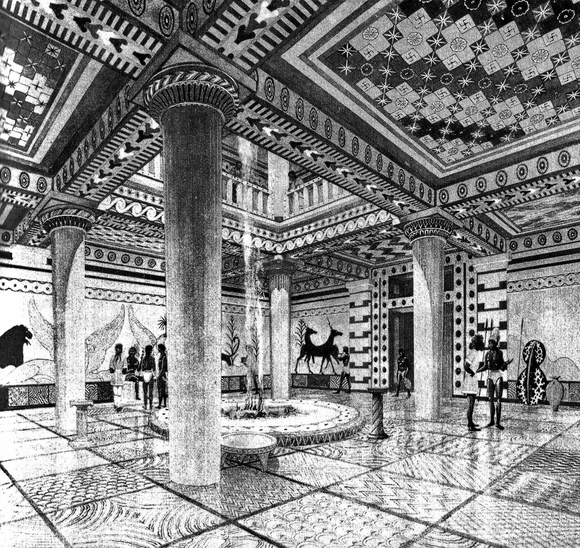 The Mycenae people constructed numerous large palaces. All of these palaces were surrounded by enormous defensive stone walls. They dug long tunnels that led outside of the palace to a water source in case of a siege or attack. These people were fairly advanced. They utilized bronze weapons, wore body armor, and protective helmets. Mycenaean swords and the bronze double ax were especially effective. Their written language was called Linear B. The Mycenaean prospered by exporting their excess agricultural products. One of their primary products was perfume. The Mycenaean perfume industry was under the direct supervision of the nobility. They also maintained enormous flocks of sheep. Some were as large as 100,000 animals. The sheep produced wool and meat. The wool was a highly desirous trade item that was sold throughout the Mediterranean. The Mycenae also grew olives for oil and grapes for wine which were placed in sealed jars so that they could be exported for trade. Mycenaean pottery was very popular in Italy. At this time the Mycenaean imported a wide variety of luxury items including; tin, gold, bronze, copper, ivory, and glass. Today, the Mycenaean civilization is probably best remembered because of the great Greek poet named Homer. Sometime around 800 BC, Homer wrote his long epic poems entitled the Iliad and the Odyssey. The poems told stories of Mycenaean heroes. They are believed to have been based on actually occurrences that took place centuries before. Until the time of Homer, these stories had been passed down orally. Homer was the first to put them in writing. The Iliad tells the story of King Agamemnon and how he and his people went to war with the Trojans of Troy. The war started when Helen, the beautiful wife of King Agamemnon's brother, was kidnapped by the Trojans and taken to Troy which was in northern Turkey. The war went on for more than ten years because of the enormous wall that surrounded the city kept the Mycenae from invading. Then out of frustration the Mycenaean came up with an idea. They constructed an enormous wooden horse and left it outside of the gates to Troy, and then sailed away like they had been defeated. The Trojans thought it must be some kind of peace offering or tribute to them so they opened the gate and brought it inside. What they did not know was that the horse was filled with Mycenaean soldiers. That night the hidden soldiers open the front gates and let in their army. As a result, the Mycenaean army defeated the Trojans of Troy. The Odyssey is the story of a man named Odysseus and his incredible journey home after the conclusion of the Trojan War.